“A SIT-ON-TOP kayak is a wide hog so [paddle size and blade shape] don’t matter.” This quote from Ed Vater, president of Bending Branches, appears in my 2007 book The Complete Kayak Fisherman. Boy, how things have changed. 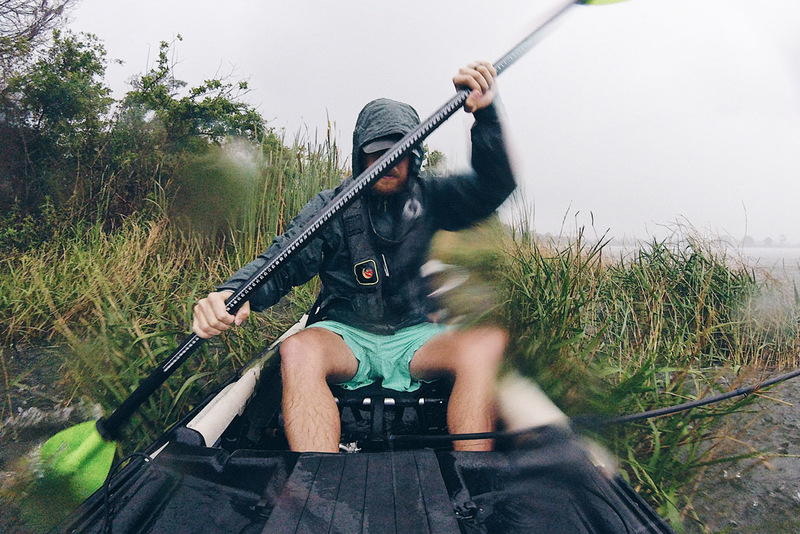 In the last 10 years, paddles designed for fishing kayaks have gone from gimmick to purpose-built as designers tackle the challenge of moving a big, heavy kayak with a toothpick and two feathers. A decade ago, paddle designers wrote off fishing kayaks as barges you could paddle with a two-by-four. Since then, the exploding market has become so competitive, companies are pulling all the stops to make the best performing fishing paddles. Brooks Smothers, marketing director at Werner Paddles, refers to the company’s slogan, “A great kayak fishing paddle is a great paddling paddle.” To make a great paddle, Werner uses the best materials to handcraft efficient and durable paddles that look great. “The blade shape and construction is the same throughout our line,” Smothers says. Whether you purchase Werner’s entry-level model or go for a top-of-the-line design, Smothers says you have a blade and shaft designed for kayak fishing. Bending Branches introduced its first fishing paddle in 2005 and added the current Angler line in 2011. Last year, after extensive testing, the company redesigned its Angler blade to suit the special needs of kayak fishermen. “It’s a hybrid between a high- and low-angle blade to satisfy 90 percent of kayak anglers,” marketing director Andrew Stern explains. Stern adds the kayak fishing explosion has inspired Bending Branches to make their paddles tougher. “Fishermen are hard on their gear so we beefed up materials and construction,” he says. Last summer, Bending Branches introduced the Angler Navigator, a tough, lightweight wood-bladed paddle reinforced to survive any abuse. “It’s popular with river anglers,” Stern says. The wood blades not only take a beating, they absorb shock, he says. Reaching out to anglers fishing wide kayaks with high seats, the latest generation of paddles also feature longer shafts. This summer, Werner added a LeverLock ferrule to adjust the shaft length. Bending Branches offers their fishing paddles with telescoping ferrules. Both options add 20 centimeters to the length and offer infinite feathering. Smothers explains, “Adjusting the seat to the high position could add four to seven centimeters to the required paddle length.” Quickly adjusting the paddle shaft to the appropriate length allows anglers to use the paddles at their most efficient and comfortable settings. Werner team member and host of the Kayak Fishing Show, Jim Sammons has seen much improvement in paddle design. Bending Branches team driver Josh Duke is equally thankful for the paddle options available. “I can use a low-angle paddle on days when I’m covering distance or go for a high-angle when I need to maneuver in tight places.” Either way, he has high-quality choices to optimize performance on a heavy fishing kayak. “We don’t have to settle for a touring paddle or an egg beater,” he jokes. Pedal kayaks haven’t threatened paddle manufacturers, they’ve inspired designers to come up with great blades for back-up power. While kick boaters may not require lightweight premium materials, they need indestructible paddles to take the abuse of pedal fishing.